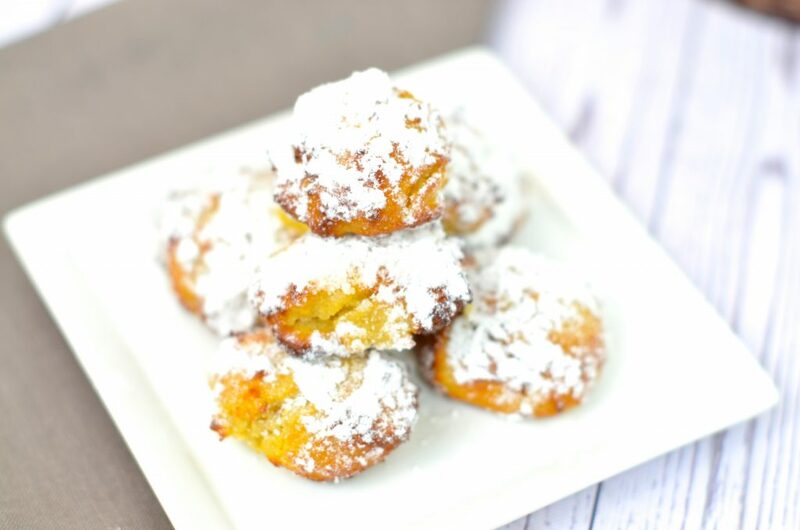 This easy air fryer dessert pays homage to our famous New Orleans beignets. 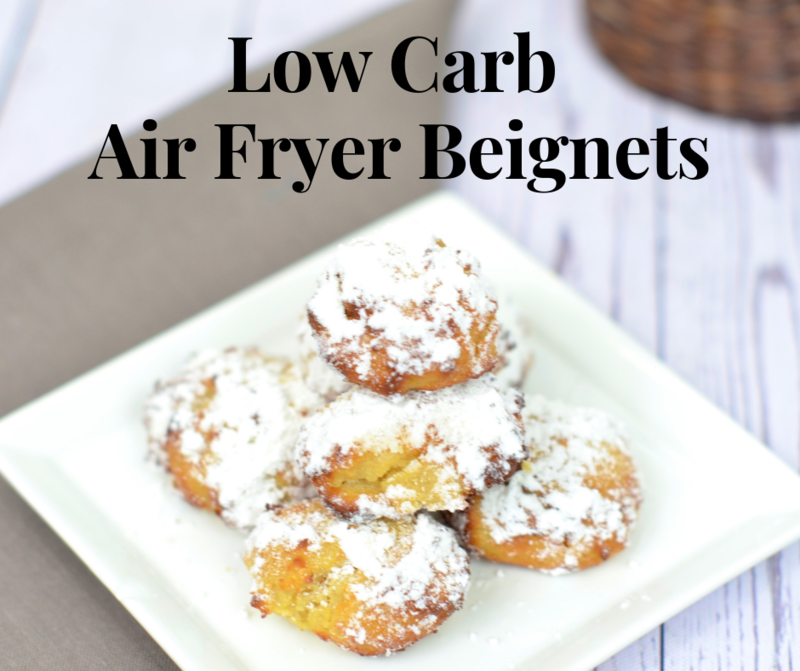 Made with simple, pantry-friendly ingredients, this low carb air fryer beignet recipe is perfect with a cup of coffee. Beignets, the amazing fluffy pillows coated with powdered sugar, are a staple for any traveler to New Orleans, but more important, taste amazing. These ‘fried dough’ creations are often served on a plate of 3, covered in powdered sugar, and served with a cup of cafe au lait. Question Time: How old were you when you first had a beignet? Honestly, I can’t remember how old I was! I was more than likely in diapers in my Maw Maw’s kitchen. Being from Houma, LA, I was blessed with the best of cooks in my family. My husband (Mr Ohio born), not so lucky. His first time trying beignets was typical out-of-tower, at Cafe Du Monde. The hot fluffy dough stared back at him as he looked down, then up at me, and said ‘Do I use a fork?’ NO! ‘No hon, use your fingers and get messy.’ And he did. And we walked out with both Cafe du Monde Beignet Mix and Cafe du Monde Coffee and Chicory. And the love affair began…. It’s time I take this Louisiana classic to the drawing board. While looking at the historical recipes of the beignet, I knew I faced challenges. Basic ingredients include flour, yeast, and oil. My two challenges were a dough with almond flour would not rise with yeast (yeast helps gluten based flours rise) AND using the Air Fryer. 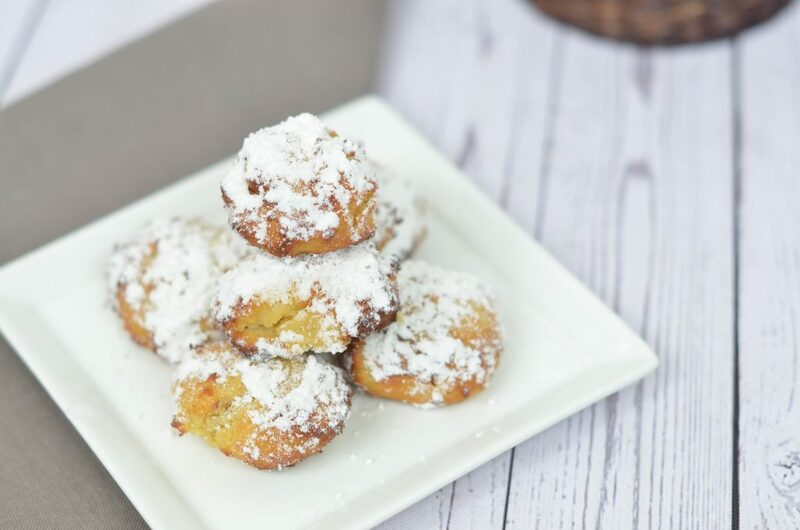 While it is not Cafe du Monde beignet mix, I developed an amazing air fryer dessert you and your family are sure to love! Let me know if you and your family tried this recipe! I love my Air Fryer! Many of you have posed the questions, ‘What Air Fryer do you have?’ ‘What is your favorite brand of Air Fryer?’ I have a basic Phillips Air Fryer and love it. I encourage folks to shop around and see what Air Fryer fits their needs. I must confess, I now own 2 Air Fryers. For Christmas, I received a Ninja Foodi, and I am ready to use this bad boy soon! Many of you know my love of Drug Emporium stores. Not only does Drug Emporium have amazing prices (often the cheapest in town), I work with this amazing company in putting on Low Carb Food Demonstrations and product selection for shelves. All my items in the recipes are from Drug Emporium. No Drug Emporium in your town? No worries, I have the links for where to purchase online! With any dessert, flour is the basic ingredient. It serves several purposes, mainly as a thickening agent and to hold the wet ingredients together. Flour in the low carb and low net carb world makes us cringe since whole wheat flour has 21 grams of carbs and 3 grams of fiber per 1/4 cup serving. Enter almond flour! Almond flour is made of almonds that have been ground to a fine texture. It is a gluten-free, keto-friendly, grain-free food and contains approximately 5-6 grams of carbs per 1/4 cup. Don’t panic over the carbs, almond flour has approximately 3 grams of fiber giving this flour a net carb of 3 per serving. And please don’t panic over the fat. Remember nuts are the fats we want to include in our diet. I do enjoy cooking with almond flour, but I personally feel due to it’s heavier texture, almond flour works best in bars, brownies, and muffins as well as in my batters for my vegetables and meats in the air-fryer. The type of almond flour does matter. Make sure to use super-fine almond flour from balanced almonds. We used Bob’s Mill Almond Flour in this recipe. You can purchase online here! Sugar is used to add sweetness to our dessert recipes. While a spoonful of sugar may help the medicine go down, at 4 grams of carbs per teaspoon, a low carb sugar alternative is needed. One of my favorite sugar replacer is Swerve. Swerve is a keto friendly sugar replacer and taste amazing. Kick those old blue and pink packets good-bye and pick up this New Orleans product. In this recipe we used 3 types of Swerve, granular, brown, and confectioners. Swerve granular is an amazing keto sugar replacer in baked goods, while our Swerve confectioners sugar replaces powdered sugar in items such as dips and frostings. Swerve brown sugar replacer is used in this recipe, as well as Swerve confectioners sugar as our topping. Can’t find Swerve at your store? It’s always available online! Yes, the recipe does call for butter. Under any circumstances, we do not use margarine in the Skinny Louisiana kitchen. We are quite mindful of the amount of butter we use, never using more than we need. A low carb milk alternative is Fairlife milk. Fairlife milk not only taste amazing, but is ultra-filtrated thus taking the carb count from twelve to six and is lactose free. The ultra filtration process increase the protein in the product. Taste? Amazing! Fairlife milk is a staple in the Skinny Louisiana house and works amazing in all our low carb recipes. You can find Fairlife milk in the milk section of most supermarkets. Xanthum gum is very popular in gluten free cooking because of its ability to thicken dishes and mimic the gluten. It is formed with the fermentation of glucose and a bacteria found in cabbage. It is traditionally added to various desserts using almond and coconut flour to prevent the product from falling apart. Xanthum gum has a high fiber count, leading to a ZERO net carb product! We used Bob’s Red Mill Xanthum Gum. Combine flour, salt, and xanthum gum. Measure milk in a glass measuring cup. Heat in microwave until boiling. Mix in Swerve brown sugar and butter. Add egg and vanilla. Combine. Pour milk mixture into flour mixture. Mix with a hand mixture on low for 1-2 minutes or until all is combine. Cover mixture and place in fridge for 30 minutes. Remove dough from fridge. Spray Air Fryer with non-stick cooking spray. Using a SMALL ice cream scoop OR 2 tablespoons, drop dough (no bigger than a tablespoon size) rounded into Air Fryer. NOTE: Make sure NOT to make beignets too big! Spray with non-stick cooking spray. Cook at 330 degrees for 5 minutes. Open tray. Check for ‘doneness.’ You may have to cook for 1-2 more minutes. Don’t overcook. 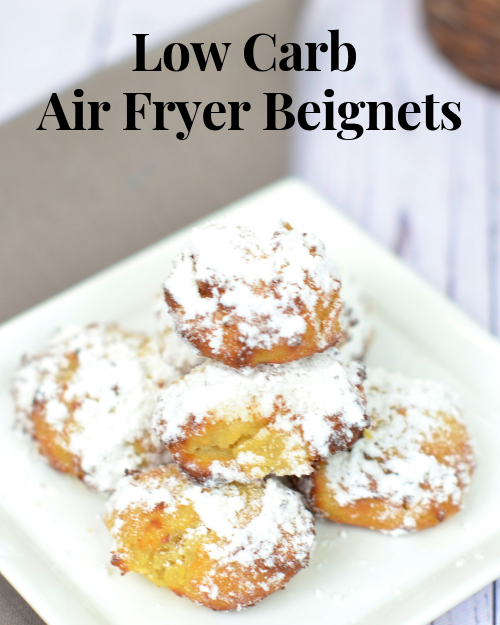 Using tongs, remove beignets from Air Fryer. Place beignets on serving platter and sprinkle with Swerve confectioners sugar. In a medium size bowl, combine almond flour, Xanthum gum, and salt. Place aside. Measure milk in a glass measuring cup. Place cup in microwave. Heat in microwave until boiling. (I heated for 1 min, 10 seconds). Using a small whisk (or spoon) mix in Swerve brown sugar replacer and butter. Make sure butter is dissolved. Add egg and vanilla in milk mixture. Whisk (or stir) until all is combined. Spray Air Fryer with non-stick cooking spray. Using a SMALL ice cream scoop OR 2 tablespoons, drop dough (no bigger than a tablespoon size) rounded into Air Fryer. Spray dough with non-stick cooking spray. NOTE: You may have to cook for 1-2 more minutes. Don’t overcook! 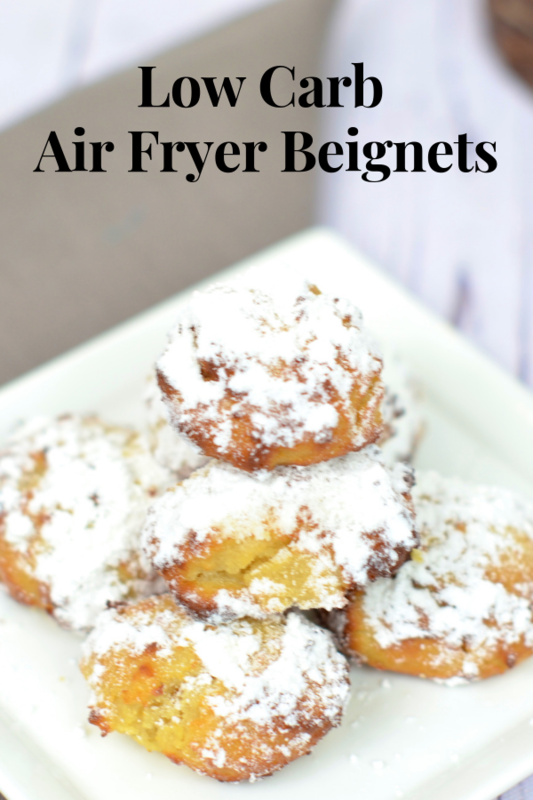 Using tongs, remove beignets from Air Fryer. Sprinkle Swerve confectioners sugar replacer on top. Calories: 50, Total Fat: 4.5g, Saturated Fat: 0.5g, Cholesterol: 10mg, Sodium: 40mg, Carbs: 2g. Fiber: 0g. Protein: 2g.